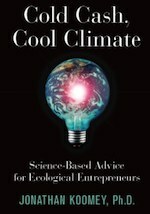 I’m no entrepreneur, but I enjoyed reading energy scientist Jonathan Koomey’s book Cold Cash, Cool Climate: Science-Based Advice for Ecological Entrepreneurs. It’s comforting to be reminded that not everything in the mitigation of climate change depends on governments, that there is a lively creativity abroad in the entrepreneurial world which can take up the challenge without waiting on the interminable processes of governmental negotiation or the rigidities of big business. Rapid change is certainly what is needed. The first information Koomey relays to his entrepreneurial readership is that climate change is a deeply serious matter. His explanation of the science is clear and thorough. Current trends if continued will end in disaster for the earth and humanity, and at the upper end of climate sensitivity would be catastrophic. There’s no fudging the issue on his part. And he has no patience with denial which he treats later in the book, recognising that entrepreneurs seeking investors may have to counter it and recommending the website Skeptical Science as a source of information. “Working forward toward a goal” is Koomey’s preferred way for entrepreneurs to look at the task ahead in tackling climate change. If the goal is to keep global warming to no more than 2oC then a greenhouse gas budget is implied, which is the cumulative amount of gases we can emit while still staying within the budget, and if we’re not on track to meet the goal then we can change course to make it more likely we’ll stay under budget. He compares this with what he describes as conventional mitigation approaches which rely on lists of policies and technologies that would reduce emissions, ranked by their costs and effectiveness. He’s not dismissive of such approaches, but points out that the problem is that the lists of possible options are incomplete and imperfect, and lead to overestimates of the costs of action. It is also difficult to predict far in advance what is feasible and what isn’t. Moreover people often underestimate the rate and scope of change that can occur with determined effort. As I understand him he considers the “working toward a goal” pathway is more flexible and less inclined to rule out options on account of over-calculated costs. Predicting the future of economic, social and technological systems is not possible with any accuracy. He evidences for example the belief thirty years ago that increase in economic prosperity would mean greater energy use. It was wrong. Forecasting models have their place, but we need to be open to unforeseeable pivotal events and ready to take advantage of them. Rapid emissions reduction is likely to mean that some capital will be scrapped before the end of its useful life. Indeed Koomey sees it as one of the tasks of entrepreneurs to make existing capital stocks obsolete more quickly. “That means developing replacement products (and ways to retrofit existing buildings and equipment) that are so much better than current ways of delivering energy services that people are willing to scrap or repurpose that equipment to gain the advantages your product provides.” Not that entrepreneurial activity should be limited to energy and carbon intensity. He nominates other important areas such as the reduction of population growth and changing the nature of GDP growth. In a key chapter of the book Koomey turns his attention to the actual opportunities that await the entrepreneurs. He provides no detailed lists of possible options, though he points to other sources for those, including, I was pleased to note, Al Gore’s impressive book Our Choice. He instead indicates wide fields where entrepreneurial endeavour could bring great benefit, such as energy efficiency and mass-produced renewable energy supply technologies in relatively small units of capacity. But he also urges care not to focus too early on feasibility and in the development of projects to engage in whole systems integrated design, illustrating the latter at some length. He counsels readers to envisage outcomes, such as, for example, those that would be made possible by a drastic fall in the cost of PV panels, and the necessary business developments that would open up. He stresses the importance of information and communication technologies in aiding the work of the entrepreneur in many different and sometimes unexpected ways. There’s no room here to go further into the details of the chapter, but it’s clear that the successful entrepreneur is one who has done their homework carefully, who has not been too much intimidated by the difficulties and who tries to avoid institutional rigidities. Koomey considers that the constraints standing between us and vastly reduced greenhouse gas emissions are mostly self-imposed – they flow from cognitive limitations that make it difficult for us to imagine a future much different from our current path. There’s so much already to hand in Koomey’s view. Vast emission reductions using current technologies can be obtained if we achieve cost reductions by employing them on a large scale. He’s for using as many as we can, finding quickly that some will fail, persevering with those that succeed. He characterises the climate problem as big, urgent, and misunderstood, all of which makes it fertile ground for new business ventures. Entrepreneurs can lead the way. Not that there aren’t vital functions for government. Koomey focuses on three in particular. Internalising costs which some industries have externalised is one, which means putting a price on carbon. Redefining property rights to reflect environmental responsibilities is another. Enforcing contracts the third. Can the kind of entrepreneurial activity Koomey hails and encourages fill the alarming gaps opening up between the emissions reduction needed and the reduction achieved? Can governments be persuaded to play their part and allow the necessary creative destruction to lead us to something more hopeful than lies ahead under present circumstances? Koomey remarks that defeatist pessimism is in the way and he for one refuses to let it get the better of him.